The RPG is an inherently inelegant creature. It is something of a Frankenstein monster, a suite of different gameplay systems stitched together into a shambling chimera. Character creation, simulated markets, item management, navigation, combat, stealth, dialogue, puzzles, class and skill trees–as a developer, it is difficult enough simply to make all of these systems, let alone integrate them and balance them so they work well together. By the time one gets to the point of having to credibly present a believable, coherent world, things can start slipping through the cracks. Monster races get developed only in flavor text; NPCs each get a single line of dialogue (or worse, share the same generic dialogue tree); allegiance to vague notions like “light” and “darkness” comes to substitute for actual characterization; and so on. Much of this, undeniably, is a matter of limited developer resources. It is very time-consuming to produce RPG content. But it is also a failure of imagination on the part of developers. It’s the details that really make a world come alive, and a little goes a long way. Here are a few areas where RPG developers could stand to focus some effort making those details come alive. RPGs are almost universally centered around conflicts with hostile characters. Given that fact, you might think that enemies would be the most carefully thought-out part of the whole game, story-wise. Sadly, they aren’t. In most RPGs, we see dozens (if not hundreds) of different monsters with varying temperaments and varying levels of mental sophistication actively cooperating, oftentimes in completely nonsensical combinations, to attack the heroes at every single opportunity as they wander the world. Monsters and human enemies alike are uniformly, suicidally aggressive. Here, three cockatrices and Petey Piranha want to fight you to the death. Of course they do. To explain this curious state of affairs, developers tend to rely the same old hand wave: “the evil wizard/demon king/dark god has released a plague of monsters upon the land.” Oh. Well, okay. That tells us almost nothing. Developers really need to ask themselves more questions to suss out details here. How did the Big Bad get access to all of those monsters? Is he paying them? If so, with what income? What about the low-intelligence monsters that don’t need or understand money? Is he breeding them? Why are all of the monsters so perfectly loyal? What about their self-preservation instincts? With so many different species of monsters, aren’t there any conflicts, natural predator-prey relationships, or factional disagreements among them? Consider the time-honored tendency of RPG developers to throw demons and dragons into the same end-game dungeons together. That makes some sense from a design perspective: you’re at the end of the game. End-game encounters should be the most challenging, and demons and dragons are perennially the most powerful monsters in RPG worlds. But from a narrative perspective, this is actually quite problematic. In cultural and literary tradition, dragons tend to spend their time hoarding material wealth, and demons are notorious for tricking others into signing unfavorable contracts. It would probably occur to a developer who had done his homework that, sooner or later, a demon would trick a dragon into signing away his hoard, leading to an explosion of racial animosity within the antagonist’s ranks. I want to see RPGs where where hatred between different monsters under the antagonist’s command leads to internecine fighting, or even a segregated dungeon. (A few RPGs–Fallout, Din’s Curse and Planescape Torment, for instance–have attempted something like this.) I want to see RPGs where the differences between different monsters and groups extend beyond elementary combat considerations. In short: I want to see RPGs where enemies feel like they are unique living creatures inhabiting the game world, and not just cannon fodder to pad out the total play time. Games in general (not just RPGs) have an unfortunate tendency to rely on event-driven plots. This leads to a handful of bad outcomes. First, event-driven plots tend to be formulaic and difficult to relate to. Because they are driven by events rather than characters, characters in event-driven plots inevitably end up doing things that make no sense in the service of hitting every bullet point on the game’s list of plot events. Worst of all, tying the plot to particular events forces the game onto rails, damaging the player’s capacity to role-play and the game’s capacity to respond convincingly to player choices. Luckily, there is a viable alternative to event-driven plots: character-driven plots. As I’ve argued before, fleshed-out and consistent NPCs can drive plot in a way that both makes internal sense and supports nonlinear gameplay. Let’s compare a familiar premise approached from an event-driven perspective, and then from a character-driven perspective. “An evil wizard plagues the land with monsters” is a prime example of an event driving the plot. All we know is that the wizard is plaguing the land with monsters. We don’t know who he is, or why he’s doing it, or how. It’s just something that happens. Evil is evil, and as a player, there’s really not much you can do with that beyond trying to kill the wizard. But hold on a moment. What if the wizard is not just a cardboard cut-out inserted into the “evil antagonist” slot? What if he is a real character? Suppose, for instance, that he is charismatic, but that he has some unfortunate paranoid tendencies that have driven away anyone he’s ever tried to become close with. Suppose that his inability to maintain a good relationship with others has resulted in his alliances collapsing. Perhaps his troops are running low on food, and his generals are starting to lose faith in him. Perhaps he’s feeling his campaign crumbling around him, and he can’t see any viable exit. Suddenly, certain things begin to make sense. Those roving bands of aggressive enemies are hungry former soldiers of the wizard’s who have mutinied and turned to banditry out of sheer desperation. Moreover, there are now some real role-playing possibilities. Perhaps the player can engineer a revolt among the wizard’s ranks. Or perhaps the players can play on the wizard’s increasing insecurity and paranoia and convince him that he must flee to avoid an attempted assassination by his own generals. Or maybe the players can arrange a marriage for the wizard and broker an armistice. (There’s an ending you never see in RPGs.) There are all kinds of different ways the plot can go if there are characters driving it; the players can then actively influence the plot by interacting with those characters. Other things to know: What has this character experienced during his/her life? What resources does this character have? Does this character have anyone that he/she trusts? Does this character have anyone that he/she distrusts? What does he/she want? What other characters have what this character wants, and how does this character feel about them? How would he/she go about trying to get what he/she wants from those other characters? Once you get a sense of what this character is all about, move on to the next. Figure out a web of relationships; plot it all out (no pun intended) on paper if it helps. You will eventually start to see the strands of a multitude of different plots emerging out of the tangle. That’s the power of characters, and it’s a power that RPGs are uniquely situated to take advantage of. Generally speaking, there are two broad categories of puzzle in RPGs. First are lateral thinking puzzles: getting past a locked door, for instance, or getting an item from an uncooperative NPC. Second are single-solution arbitrary puzzles, the sort you find littering dungeons (find the pressure plate, hit the buttons in the correct sequence, put the correct inventory item in the circle, play some variation of Tower of Hanoi, and so on). Lateral thinking puzzles are challenging to pull off well simply because a developer needs to account for all of the ways a player might sensibly try to solve them, given their character’s ordinary suite of in-game abilities. Forcing the player to use the one way you thought of shatters the coherence of your game world in a small but significant way. If you really must give the puzzle only a single solution, at least let the player try alternatives and provide a plausible explanation for why they won’t work. Beyond that difficulty, however, these kinds of puzzles are generally pretty easy to reconcile with the game world, especially when they involve NPCs (see the last few paragraphs of the previous section). Arbitrary puzzles are another matter. These are commonly used to add a new type of challenge to RPGs, forcing the player to employ spatial or logical reasoning and recall in order to progress. By their very nature, these kinds of puzzles are difficult to justify in any sort of locale outside of a horrifying death trap, such as a dungeon (the RPG kind, not the real kind). Still, one can use even purely arbitrary puzzles to flesh out the world and its characters, making them feel more real in the process. Above, you can see a portion of an otherwise arbitrary puzzle that accomplishes both of these things. In short order, the player learns more about the world of the game, as well as learning more about her character’s backstory. Just a few small details help the puzzle feel like a real feature of the game world, and not purely something the developer arbitrarily tossed in to challenge the player. Another example from Telepath RPG: Servants of God occurs in the crypt of the ancient poet-king Azur, when the party is confronted by a door with a riddle about one of the dead king’s poems. 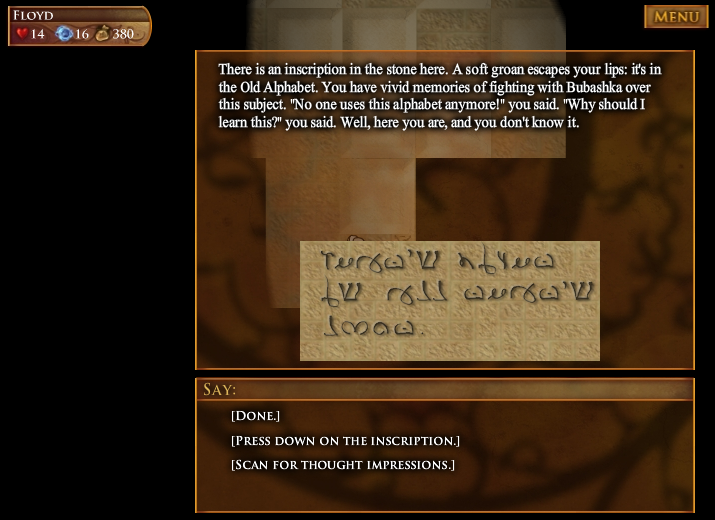 In order to successfully answer the riddle, the player will either need to learn more about the author or ask his companions for help, possibly both. 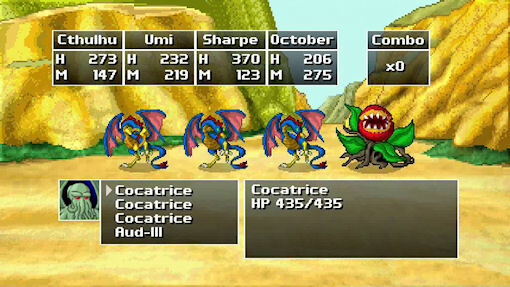 Depending on whom the player asks (and how much they like him), the other characters will offer information and suggestions of varying usefulness. In any event, the player learns more about how the other characters think and what they know about the game world. The upshot: in addition to overcoming the challenge, the player learns more about the world he’s in, the characters he’s with, or both. The puzzle is not just a challenge–it also becomes a tool for fleshing out the world and enriching the role-playing experience. According to the old proverb, the devil’s in the details. But so is role-playing. The developer who pays attention to those details can forge herself a hell of a game world. This entry was posted on Wednesday, July 27th, 2011 at 10:44 AM and is filed under Developer Rants, Game Updates. This post is tagged design principles, dialogue, Game development generally, puzzles, Telepath RPG: Servants of God, the world is in the details. You can follow any responses to this entry through the RSS 2.0 feed. leave a response or trackback from your own site.